Which show is right for your group? and make history come alive for your students through the interactive teaching styles of Mike and Belinda Adams. 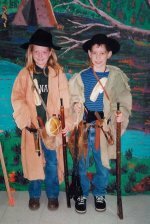 Our most requested presentations include Plains Indians, John Henry-Civil War Soldier, The Scout and the Schoolteacher, and The Mountain Men. We also offer special Storytelling and Musical shows. We offer several presentation formats to suit your needs. Find out more about our pricing structure here. 1 Hour Assembly: Pique the curiosity of your students about these hardy adventurers. Using first person characterization and storytelling, Blue Hawk and Morning Star will make your students want to read and know more. A good introduction to studying the west through the eyes of our early explorers. *This format is especially suitable for an all-school assembly or other large group. We also offer a special price for three 1-hour assemblies on the same day. Please see 'Pricing' for a complete list of costs and available options. 1/2 Day Program: Rotate each class past a small museum display of original artifacts where students can ask individual questions. *Specifically designed to give personal attention to several classes. 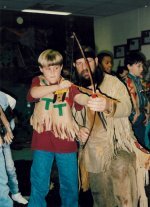 All Day Program: A hands-on 'learning experience' as your students (one class of 25) try their hands at trap setting, tomahawk throwing, hooping a beaver skin, and dressing up as Mountain Men. Plus, an indepth look at the Adam's Museum of Trade Goods, Personal Gear, and Trapping equipment of the 1800's. A unequaled chance for your students to slip back in time and gain an understanding of the Trappers & Explorers who learned to live 'with the land'. *Uniquely structured to give a small group the most immersive experience available. If none of these options suit your special requirements, please contact us about alternatives.